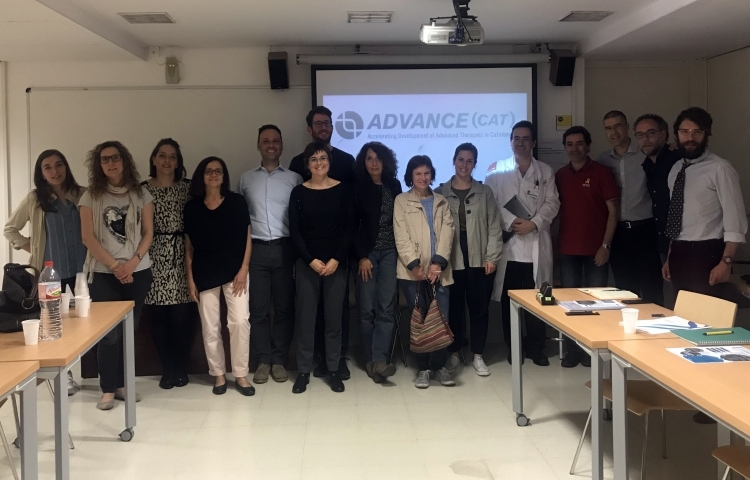 The Barcelona Macula Foundation (BMF) took part in the meeting of the consortium of the ADVANCE(CAT) European project on 26 April at the Clinic Hospital in Barcelona. The meeting included presentation of the results obtained by the various collaborators in the first quarter and study of the agreements pending for the coming months. Progress is currently being made in the generation of natural scaffolds for bone regeneration through the development of different formulations that considerably increase its viability. In addition, therapeutic strategies are being developed that are based on the combination of cells with natural molecules and scaffolds. An example of these are stem cell differentiation strategies in pancreatic beta cell phenotypes where the differentiation protocol used has been optimised by adding a cocktail of soluble factors in the culture medium and modifying the surface of the material used with RGD dendrimers. In addition, with regard to the viability studies of mesenchymal stem cell differentiation for cardiac regeneration that are being conducted in the project, a bioreactor is being developed for the extraction of mesenchymal cell exosomes under totally sterile conditions, bringing about a 100-fold increase in their production. On a different note, one of the new features of recent months is the collaboration established between the BMF and ButlerScientific within the project. It is planned to conduct an exploratory study of the data obtained from the experiments in retinal cell therapy using the AutoDiscovery software, which will reveal new and complex relationships in this data. Finally, there was presentation of the studies carried out and the results obtained as part of the tasks included in the Communication Plan. The communication team, comprising members of the University of Barcelona and the BMF, encouraged the partners to disseminate the scientific results through the different channels. This programme is co-funded by the Agency for Business Competitiveness of the Government of Catalonia and the EU as part of the ERDF (European Regional Development Fund) Catalonia 2014-2020 operational programme.